Digitex, the company behind the ICO which is aiming to develop the anticipated crypto futures exchange, recently released sneak peeps into what the platform will look like, while public launch is expected to take place in the short-term future. Digitex revealed that the platform comes with a suite of trading tools: For instance, the exchange reportedly features the option to place and monitor multiple orders, the popular candlestick chart style as well as an exciting virtual Digitex Ladder that displays real-time price action. The new exchange will feature multiple browser support for most major operating systems including the most famous Windows, and iOS. 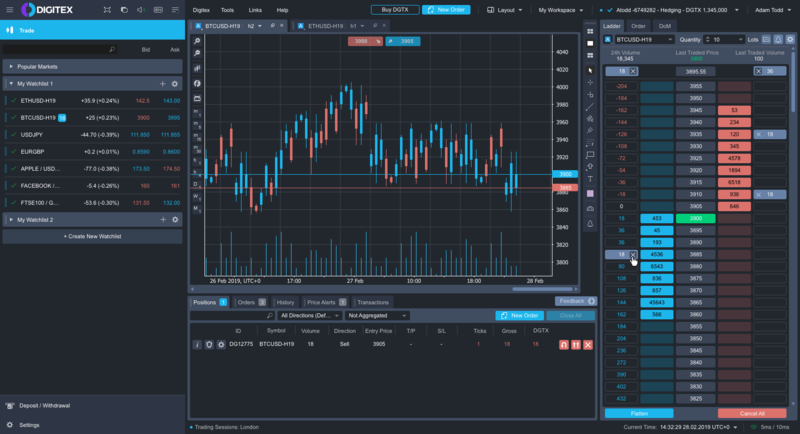 Aside from giving traders the opportunity to visualize price movements easily, Digitex claims its designated Ladder also comes with some one-click features that allow users to instantly submit trades, take profit, minimize losses or cancel trades. Additionally, traders will be able to establish rules within the platform to reduce the level of manual work and automate specific functions that the trading bot will execute. Rather than going through the order books, the new platform will reportedly allow traders to adjust existing orders and positions by simply dragging and dropping the elements available on the chart. The Digitex team also said it would add a variety of educational tools to help first-time crypto users interact with the platform once they get on board. As anyone would expect, Digitex’s coming-up release had an astounding effect on the price of its native platform token (DGTX), whereas the value of DGTX has surged by almost 100% over the past ten days. DGTX is now trading at $0.67 at press time while its market cap is touching the $50 million mark. Given, the level of growth that Digitex has recorded in the past week, despite the exchange still under development, it would not be wrong to say that Bitmex, the most popular Bitcoin margin trading exchange could face its most stern competitor in the coming months. The mini-battle was only delayed when Digitex had failed to hit the Q4 2018 timeline it initially set for launching the exchange. With the latest development, however, it seems the official roll-out would happen sooner rather than later. The post BitMEX Beware: Digitex (DGTX) Surges 90% in 10 Days and Gives a Glance To The Anticipated Crypto Futures Exchange appeared first on CryptoPotato.